With my new work and commute schedule, Scott, my SO, and I have been exploring different activities to keep us both active on our dates. This past month, I've been trying my hand with outdoor activities. Scott is quite the outdoors lover, so he suggested I give mountain biking a try. He didn't have to twist my arm for me to say "yes". Given that I have massive quads, I figured that mountain biking would be a piece of cake for me. I wasn't willing to invest thousands of dollars for a top of the line bike, so we headed to a Super Center to get a basic functional bike for $90. 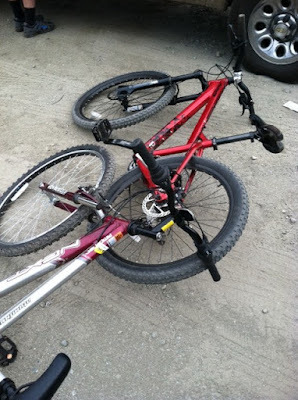 Our mountain bikes ready to be ridden! 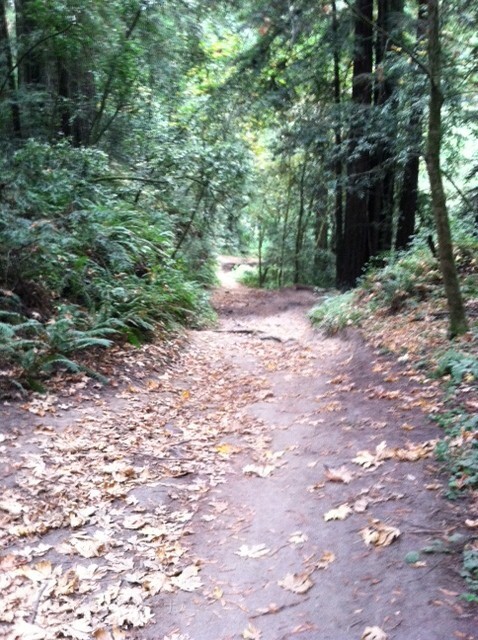 Scott took me out to Nisene Marks State Park in Aptos. Nisene Marks has a trails for beginners and the more advanced rider. After a warm-up on the Fire Road (a low incline road that goes through the entire park), I got brave and rode trails alongside the Road. After pedaling for a good hour my quads, glutes, and hams were on fire! 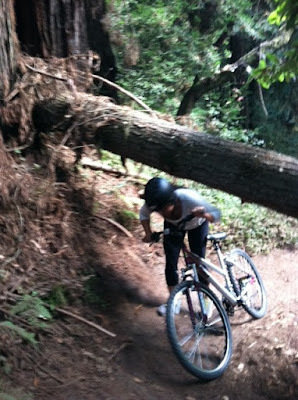 Not to mention, my bottom was sore from the bumpy ride. That hour was just a warm-up. Another two hours whizzed by quickly! Exploring the trails and breathing in the fresh air was such a refreshing change of pace that I forgot how hard my body was working pedaling and adjusting to the terrain. Slow and steady does down this bumpy trail. Learn how to properly use gears (and ratios if your bike has it) to maximize your pedaling efforts. This will prevent you from fatiguing your legs early. Rule of thumb is higher gears for lower incline, lower gears for higher inclines. Hydrate along the way. You can burn up to 500 calories an hour (depends on body weight and fitness levels). This means whether you feel it or not your body is working hard and sweating to keep cool. 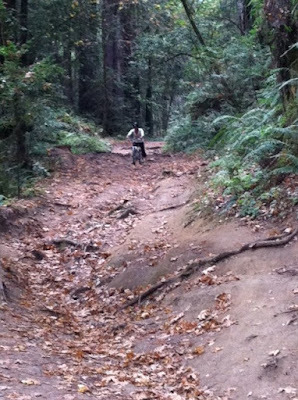 Riding on the different terrains and up and down hills worked worked all the major leg muscles: quards, hams, and glutes. My core and lower back got worked too. Keeping a tight core through the ride helped alleviate pressure off my lower back from being in a sitting position for three hours. 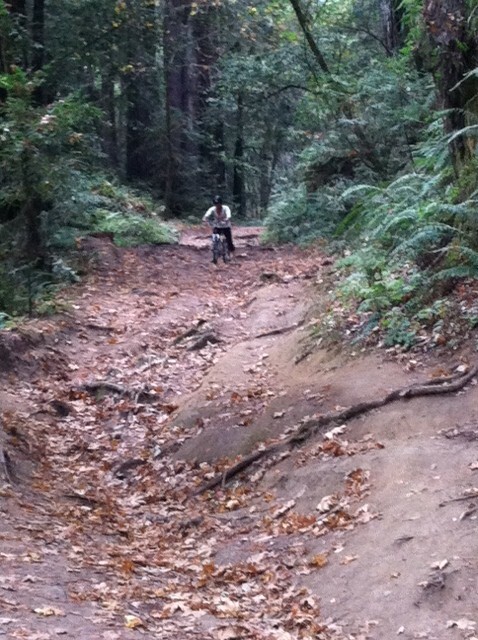 Since our first ride, we've gone out several more times to Nisene Marks. This last time, we hiked up a steep hill for a good 30 minutes. As much as I complained about my burning legs and fatiguing upper body from lugging my bike along, the feel of the wind on the 10-minute ride down was so awesome! Me and Scott - Safety first! Remember to wear at least a helmet. Any other "active" date ideas? I'm thinking about batting cages for a great ab workout or a steep hike somewhere... What do you think? 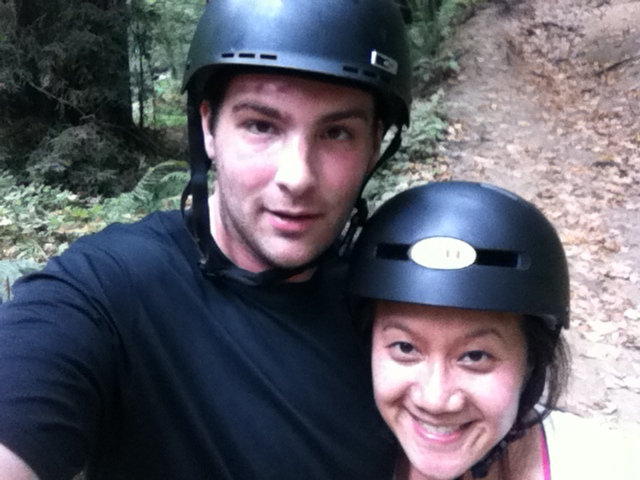 I'm so afraid of mountain biking! I worry about crashing face first into a tree, or scraping along a hill. I would be much happier going to the batting cages. for a second there, that picture of you under the tree looked to me like you were whizzing under it on your bike! then i read the caption, haha.